During press rounds for Fantastic Beasts: The Crimes of Grindelwald earlier this month, Alison Sudol and Dan Fogler spoke opening about the harrowing and heartbreaking turns of their characters - Queenie Goldstein and Jacob Kowalski, respectively - in the second installment in J.K. Rowling's saga. SnitchSeeker was among the group of reporters interviewing the pair, who chatted about Rowling's script, the surprise turns for their characters (NOTE, MAJOR SPOILERS BELOW), and what they hope for Queenie and Jacob for the rest of the series. How heartbreaking was it for you to read the script? 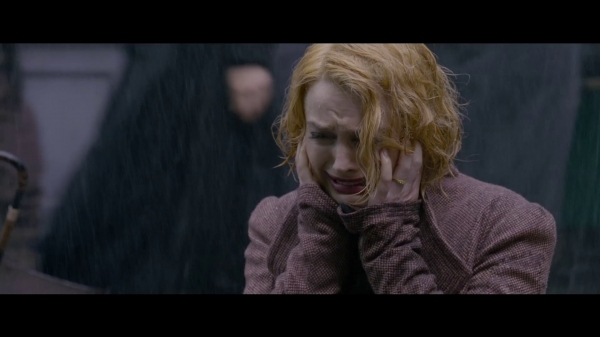 Alison Sudol: It was painful. It was definitely painful. When you care about characters so much and you see something like this happen, it’s like (crying sounds). But we really dug into it. I dug in with David Yates, and then David to Jo, to make sure that we could do all that we could to give the story as much depth and clarity as to why our characters would go on these roads, why Queenie would make the choices that she did. There’s very little time because there’s obviously a lot of story to tell. So we had very little time to establish quite large milestones. I hope that it is there in the performance that you have somebody who just deeply wants to love the person that they love and be able to be with them. The system they’re in prevents them from that. It seems to be the thing causing the biggest rift. She really just wants to be normal and have a normal life. She also has this gift, and that’s also a problem. It’s a gift that nobody around her sees her or wants. It’s just kind of annoying everyone. The gift is sort of turning against her as well. So if you look at it that way, you can kind of see why these certain things happen in this storyline. It’s not that she’s suddenly bad or someone different , she’s just going on a crazy journey. Dan Fogler: It’s really heartbreaking. I watched the movie twice; I cried twice. At least twice. At least three times. And I was there. Reading the scripts, you see everybody is dispersed. It makes for good drama. You don’t want everything to be just: Yay! Tulips and roses. So all the lovers are torn asunder, and they take their time trying to, over the next couple of movies, getting together again. I hope we get back together. Alison: So do I, but we have no idea. Were you surprised or did you know anything about the story before you got the script? Dan: I only knew a little bit going into it. A lot of it was a big surprise. Alison: I knew the arc. I knew what was going to happen at the end. And I knew the events that sparked it. And I was told that quite awhile before I got the script. So I spent months going, “How? How does this happen? How am I gonna go there?” I was just so stressed out about it. Even when I read the script, I was still shocked. How much input do you have when you’re working with Yates? Alison: It’s very alive. You can feel it. In the first movie you were part of the sweetest love story and a comic relief, and now in this movie, your story was one of the saddest. How did you prepare for that? There’s loads of Harry Potter connections in this film. Did you geek out? What do you think the fans will love? Alison: But it was also very cool having Jude join us as young Dumbledore, and seeing his interpretation, which was wonderful. Dan: Yeah I was gonna say, everyone’s wondering, “Is he gonna live up to it?” And he does! He’s perfect! Dan: In my opinion, his accent, the glint in his eye, the shape of his beard. Alison: It’s a good beard shape. Dan: It’s a good beard. Alison: And then there are things – we don’t want to give them away – there are some rather wild things, especially right at the end, that are part of Harry Potter lore that are like, “Whoaaaa!” So, I think it’s quite cool, and it’s exciting because having met so many people in the fandom over the past couple of years the fans are so detailed. There love and appreciation for these stories. I actually researched more about legilimancy on YouTube through the fans, “Oh, Snape had it too, but she’s much more powerful than I knew.” So there’s something really cool and exciting about – kind of like Christmas when you gave somebody a really good gift and you’re like, “Oh, you guys are gonna like that.” That’s pretty fun. SnitchSeeker: So obviously Queenie is a very good judge of character of the people around her because of her abilities. With some of the new characters she’s become involved with in this movie, do you think she has any ideas about things their thinking they might not be aware that she knows? Alison: You know, yes, she is a good judge of character, but she has a very tricky character flaw herself in her gift, which is that she’s not good with accents – and languages, forget about it. So, she’s in Paris. So it’s like, imagine, that you just rely on your eyesight – because that’s what you do – and then one day somebody tapes a blindfold onto your eyes. You don’t have any other skill sets. You’ve used that so much and suddenly you have to make your way around. You have to discover how to go in the world that way. That’s sort of what it is. It’s almost like more disorienting than if she hadn’t had that gift. Alison: It’s true, there’s a purity … because her gift hasn’t been something that she has been taught to use. She hasn’t been mentored. It is literally, “Queenie, stop reading my mind.” She could be one of the great witches of her all time with this gift, but it’s seen as a nuisance. So, if you don’t have mentorship, and you’re taught that something about you is wrong – and you aren’t developing it, it’s only just happening to you – then the discernment between a pure intention and a pure intention of harm, you know, is quite confusing if it muddles the senses. That’s what we encounter in this with her. SnitchSeeker: Is there anything you can say about her developing that more? Alison: Well, you know, we have five movies. So I hope that throughout the development of these movies that we’ll see a growing integration of her as a human being, integrating her gift and becoming more self-aware, and growing up and owning who she is more. Who knows what that journey is gonna look like? But I have high hopes for her. How has your character being involved in this magical world helped you do deal with your health? Alison: You know it’s interesting because in preparing for this film, there were certain things that brought up such a deep emotional reaction in me that I was like, “Oh, this is not about this film. This is like some person stuff that this is bringing up, that’s quite heavy.” So I had to do a lot of personal work to open up that period of time. And honestly, that period of time was when I was first making music, around when my first record came out. I forced myself to listen to my first record, which I would not listen to for ten years. And like, I watched YouTubes of myself, which was gut-wrenching because of what state I was in at that time, but it opened doors to healing that I had really firmly shut and I couldn’t face before. But because of Queenie, how much I love the character, I didn’t want to bring my crap into it to affect the performance. Because of her, I actually healed quite a lot. I’ve just gone back to music. I’ve just released my brand new AP. I just performed live for the first time last week. I just feel like that is the gift of this that is actual magic. The movie is about choosing sides and having a belief. What is your belief in your live? Dan: I’m happy to say that I’m on the side of love and compassion and empathy, and JK says that’s the most powerful magic. So, BAM! I won. Alison: Yeah, choose love. Choose compassion. Choose kindness. Choose to look beyond – just trying to look beyond the things that divide us and to see the human being on the other side. And realize there is another side. We’re all just people, trying our best. And also aligning the planet. What are we doing? What effect is it having on our home? Seeing what actions you take from there. And believing that there’s something bigger, something wonderful, something intelligent, something animating all of this – whatever fate, kismet, the universe or something out there. Order tickets here for Fantastic Beasts: The Crimes of Grindelwald at Fandango now.